These are coffee mornings where Mums can meet up and chat with other Mums who may be feeling the same way. Some parents can feel isolated, whether emotionally or physically and this can be a difficult aspect of parenthood. Other parents may not feel themselves, their energy levels have dropped or a cloud is hanging over them. These coffee mornings allow Mums to talk, in confidence, of postnatal depression or feeling low about parenthood. If you are feeling vulnerable, need support or are feeling a little low about parenthood, being able to talk about concerns and share experiences with others in the same situation as you can be very helpful. Or why not just to come along and enjoy the company? These coffee mornings may not be in every branch as they are volunteer dependant. See our Parent to Parent supporters contact list or Contact someone locally in Cuidiú today. Cuidu also operate an Experience and Resource Sharing facility run by parent to parent supporters. For more information follow link to Experience and resource Sharing. 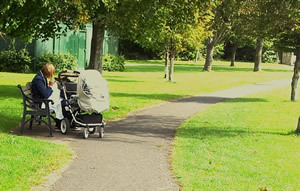 See in links section on this web site for other resources, who have information and supports for postnatal depression.